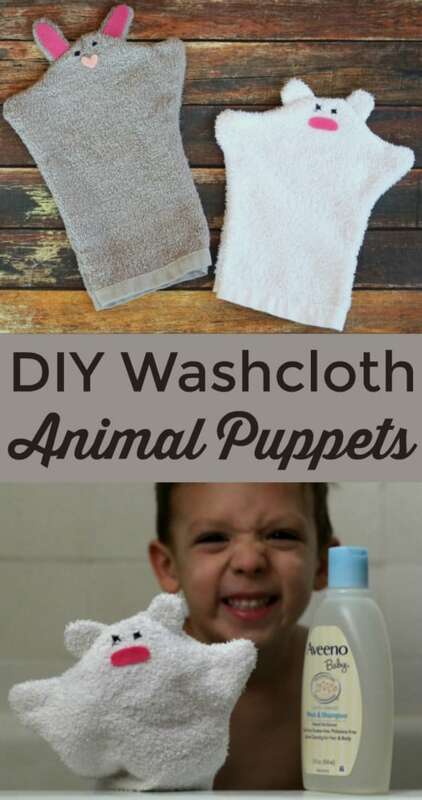 DIY Washcloth Animal Puppets - Makes The Nighttime Routine Easier! 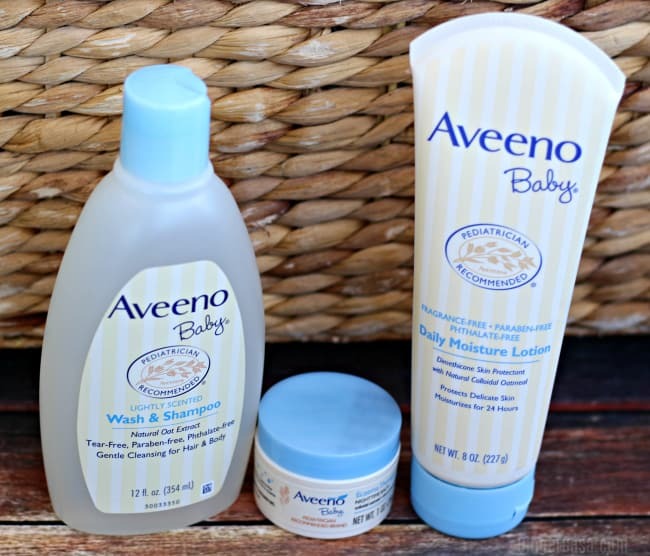 I have been compensated by AVEENO® Baby for this post; however, I am sharing my own thoughts. All opinions are my own. The holidays are over and it’s back to life, back to reality! With crazy schedules, illness, and delayed bedtimes, I admit that my kids took far fewer baths that the needed to. Some days it was just carrying them from the car to the bed because they fell asleep on the way home from wherever we were. It is time to refocus and get back into the routine of everyday life. 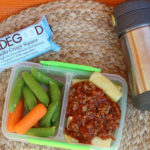 Routines make everyone happier because we know what to expect, when to expect it, and as a result, we get enough sleep AND have proper hygiene, which helps keep us happy and healthy during these winter months! When my boys have gone without regular bedtime routines, I sometimes need to think of ways to make bath time more fun. Simple things really go a long way. 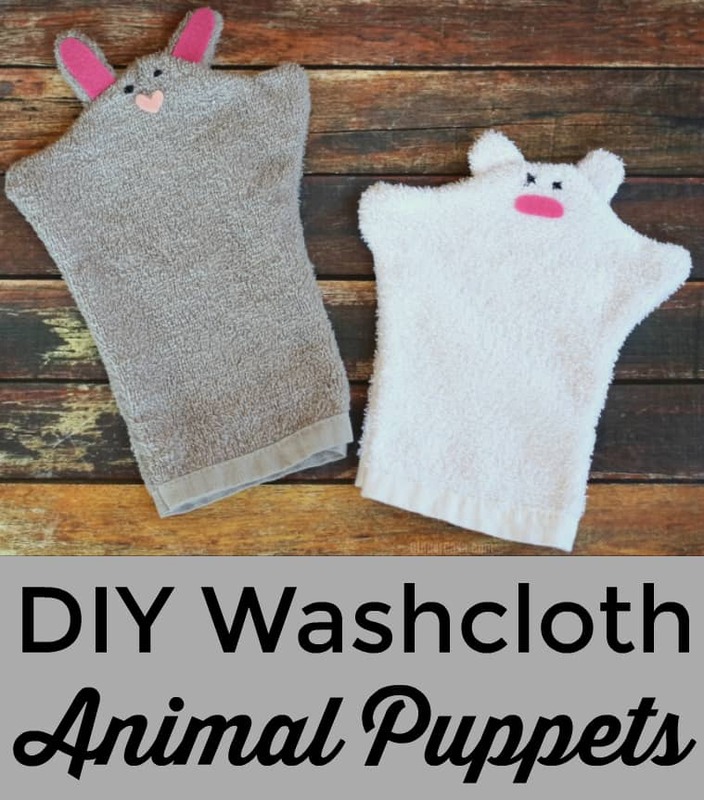 I made two washcloth animal puppets in less than an hour one evening. They are fun to play with an since it is something new to my kids, it got them in the tub and soaping up without a fuss! 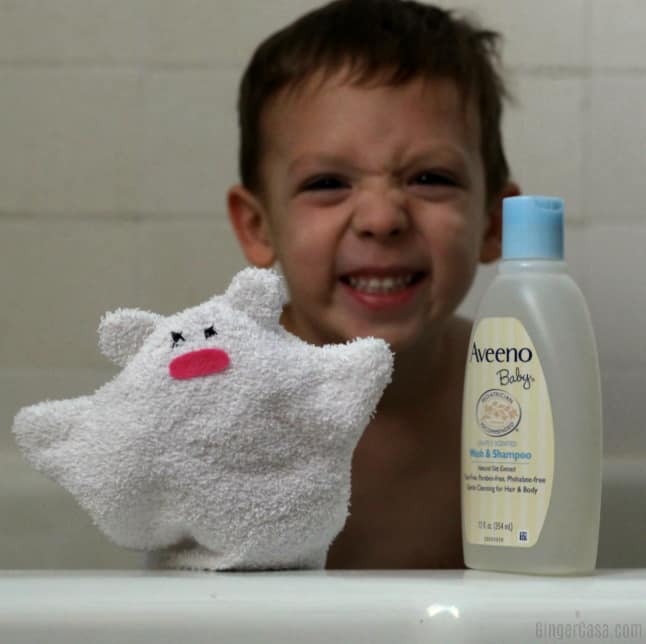 I had just bought some new AVEENO® Baby products, too, and new bath products always make things more exciting. 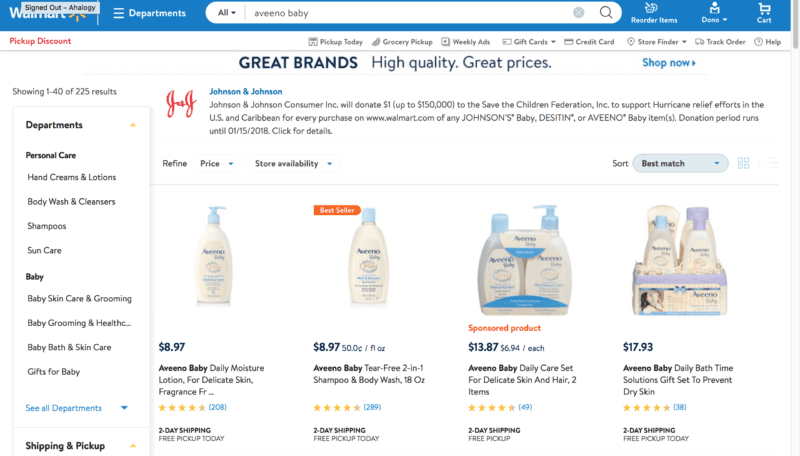 The AVEENO® Baby line is available at Walmart and Walmart.com. If you are in a rush, you can order same day pickup at Walmart. I like to order things ahead of time at Walmart.com and have them shipped to me! 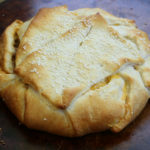 I also picked up some terrycloth towels at Walmart for less than $2 each, which made a great material for this project! 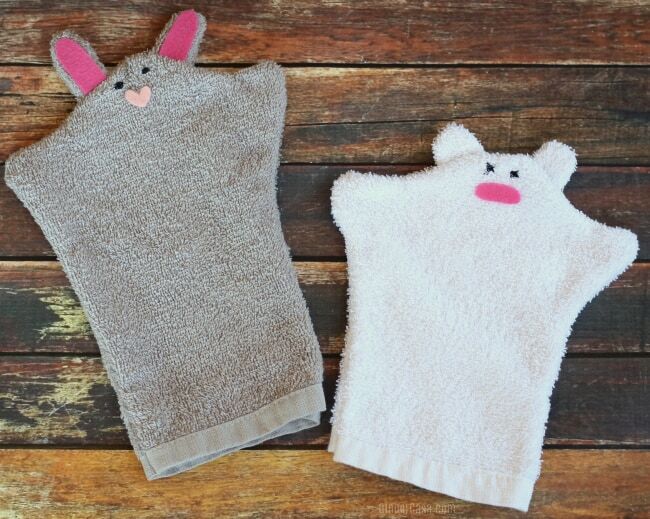 Wash and dry hand towels and washable felt. 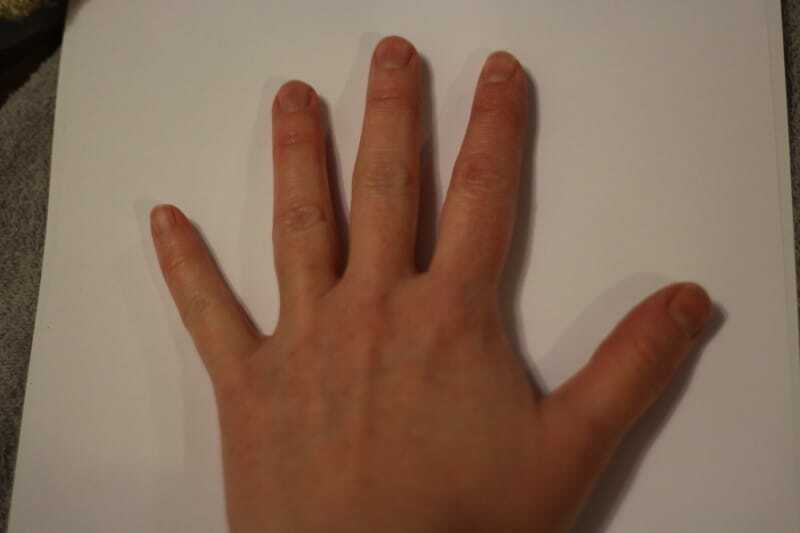 On a piece of white paper, flatten out your hand and trace around it to make your pattern. This takes some freehand, but it is fairly simple. Just trace around your thumb and pinky, and then eyeball it and add ears on top. When you are happy with your pattern, cut it out. 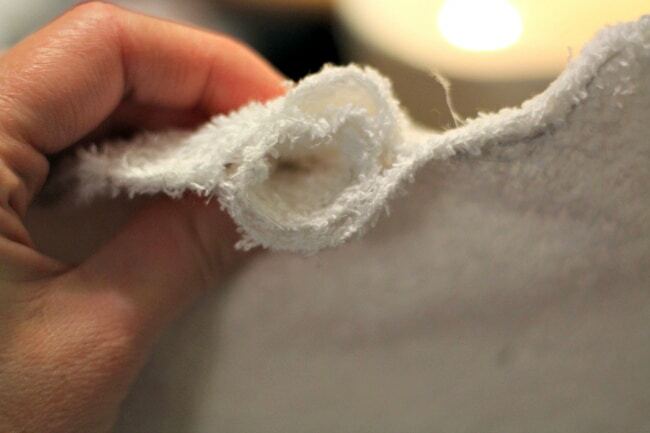 Fold the towel in half, putting the seams together. Pin the paper pattern on top of the folded towel. Carefully cut the pattern out and pin the pieces together. Cut the ears off and set them aside. I know, this is painful, but it makes it easier, I promise! Where the ears were, place a pin on either side. In between the pins will be a hole, and you will need to reinforce the sides well. 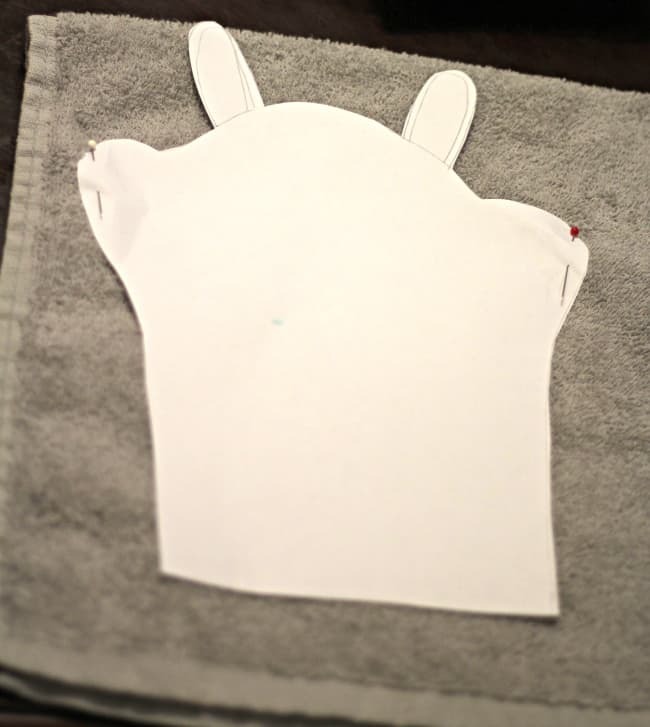 Sew the terrycloth pieces together, leaving the bottom open and also the holes for the ears. 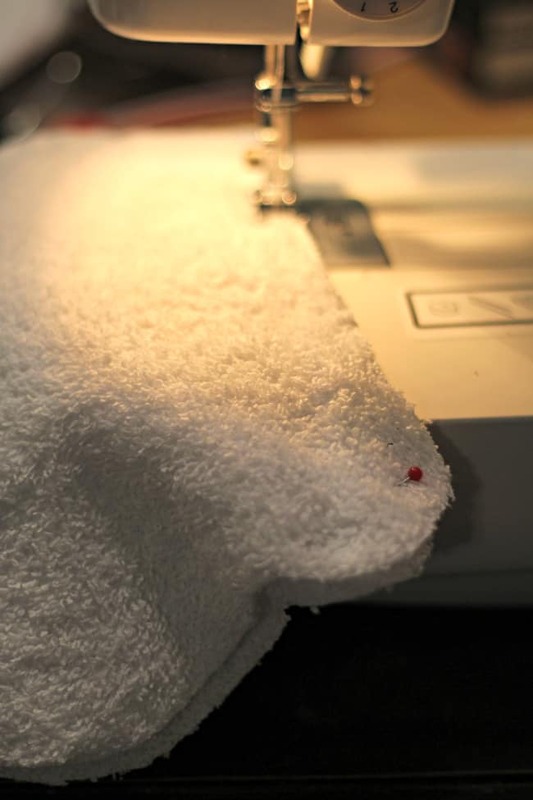 Make sure to double or triple stitch the beginning and ending spots so it will be reinforced and won’t easily be ripped. Next, sew the ears. You can do this by hand if your ears are too small. Flip the ears where the seams are inside. Gently slip the finished ears inside the two holes you left open for the ears. This will make them pop out when you turn the puppet right side out. With a needle and thread or sewing machine, sew the ears in, following the original seam line on the edges of the puppet. You will want to sew over it about 2-3 times so it will be very secure and the ears won’t be able to be removed. Finally, turn the puppet right side out and see the cute animal with it’s ears! You can for sure leave the puppets as is, but add embellishments like color for the ears, noses, eyes, and mouths. I chose to leave mouths off of my puppets because I like how they turned out, but you can do whatever your heart desires! 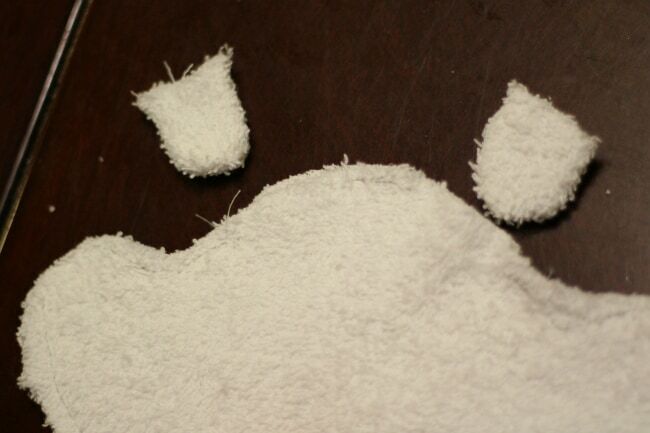 I cut pieces of washable felt for the ears on the rabbit and noses. Then I attached them with heavy duty fabric glue and placed them under a heavy item for 12 hours to make sure they were very well secured. Lastly, I took a needle and black thread to sew eyes onto my puppets. The puppets make bath time more fun and easier….and that makes me happy! 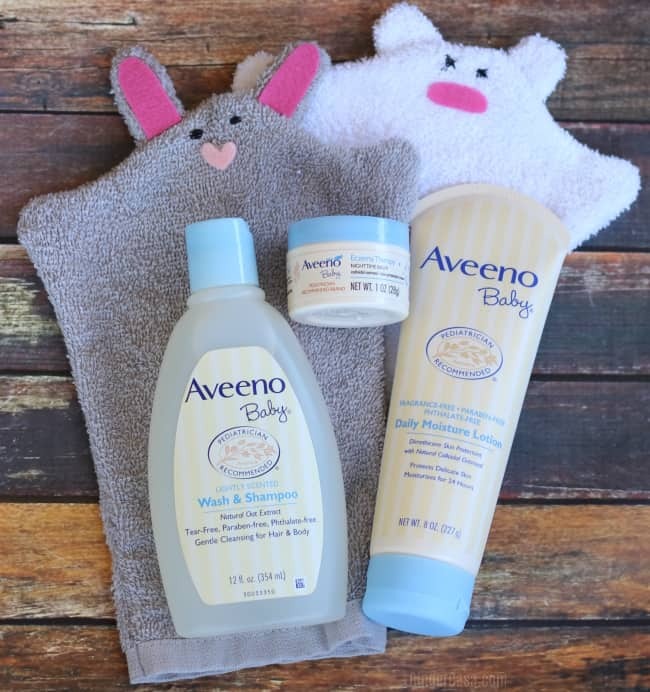 All three of my boys have really dry skin in the winter, so I love using AVEENO® Baby products for them. 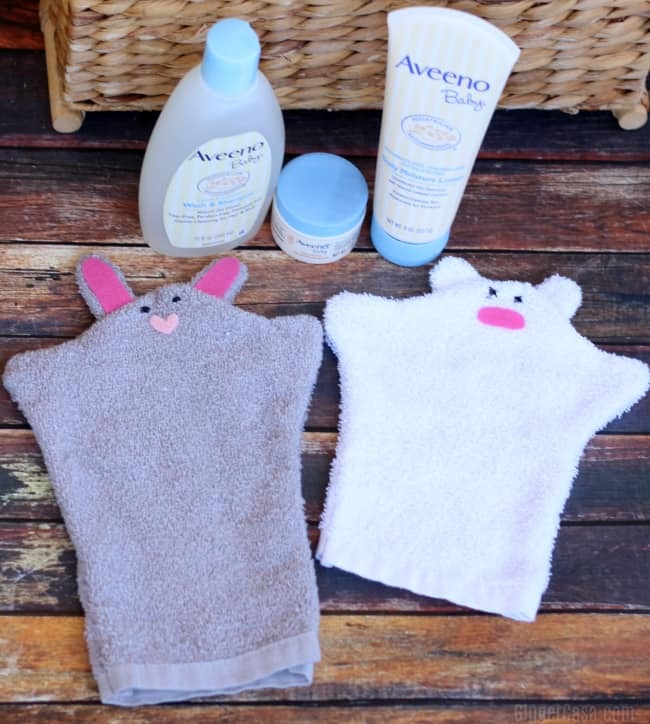 AVEENO® Baby products are gentle and protects and moisturizes their skin, making it soft and non-itchy! They have a line of eczema products, too, that are great for all ages. So after a warm bath, the boys put on their pajamas, take their vitamins, have a snack, brush teeth, and then it’s hugs and kisses and prayers before a good night’s sleep! If someone is reporting an adverse event or a product quality complaint, please tell them to call the Johnson & Johnson (J&J) North America Consumer Care Center at 800-361- 8068 during normal business hours of operation: Monday through Friday, 8 a.m. to 8 p.m. ET. After normal business hours, they can report adverse events or product quality complaints through www.jnj.com Contact Us page. How do you simplify your bedtime routine?